A university which became embroiled in an admissions row says it will continue to take the educational context of its prospective students into account. 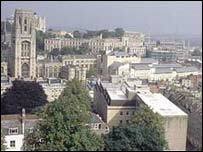 In its reviewed policy for the coming academic year, the University of Bristol says it reserves the right to "have a regard" for information on where its prospective students went to school. The University was criticised for this policy - mainly by private schools who said it was discriminatory, but also by the state sector. It denies it has a preference for students from either sector. A group which represents the heads of some public schools in the UK, which led the criticism of the policy, said it would not comment on the plans until it had studied them. But a spokesperson for the Headmasters' and Headmistresses' Conference and the Girls' Schools Association said their advice - that pupils of independent schools should not be encouraged to apply to the University - still stood. A spokesperson for Bristol University told BBC News Online: "It is not a disadvantage or an advantage to attend a particular type of school. "We want to maintain our commitment to widening participation and encouraging the broadest possible spread of applicants from social and educational backgrounds," he added. A taskforce has recently been set up by the government to ensure access to university is fair - and that universities try to encourage poorer students to apply. In a statement on its website, the University continues: "We reconsider our admissions procedures annually. "In recent years, Bristol and some other leading universities have been accused of bias both for and against applicants from the state and independent education sectors. "Bristol has always insisted that it opposes discrimination of any kind, and has strongly defended the need to take educational context into account when judging candidates' academic potential."